Grill Ministri? Yes, one might wonder if it is a place which serves great Steaks and Sizzler's. Nope, they don't serve em! Okay? Then you might wonder if it is a place which serves amazing Arabian Grilled Chicken. Again nope! They don't serve em! Finally you might wonder if it might be some kind of a place similar to BBQ Nation. I am really sorry to say that the name might have confused you. 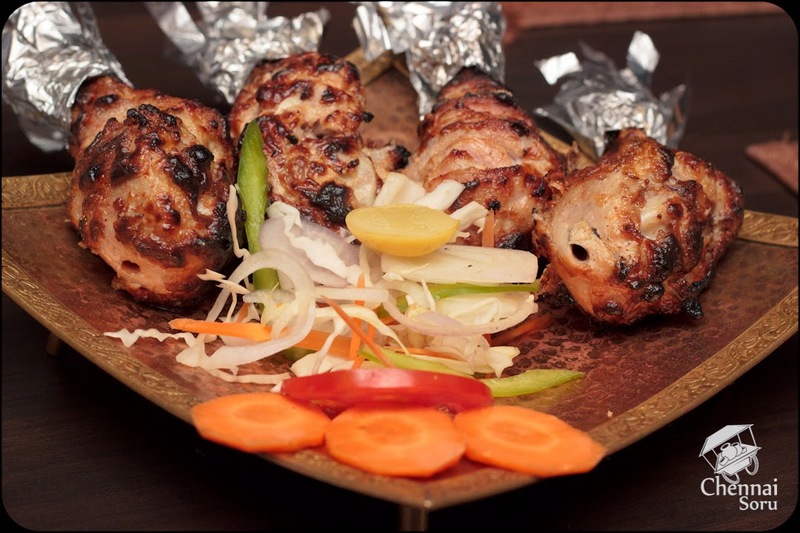 Grill Ministri is essentially a proper North Indian family restaurant. Even I had this confusion until I did a small research on it. I was invited here to dine the other night. I must say it was the....... No I am not giving away the conclusion just yet. READ ON! Dining along with owner gives you the insight into the hard work which has gone in for this project. A small chat might even kindle one to become an entrepreneur like him. We started the meal with a smooth Chicken Shorba. A Shorba which was rich like no other, with real fat and cream. Loved it. Next up, starters was a round of chicken dishes. 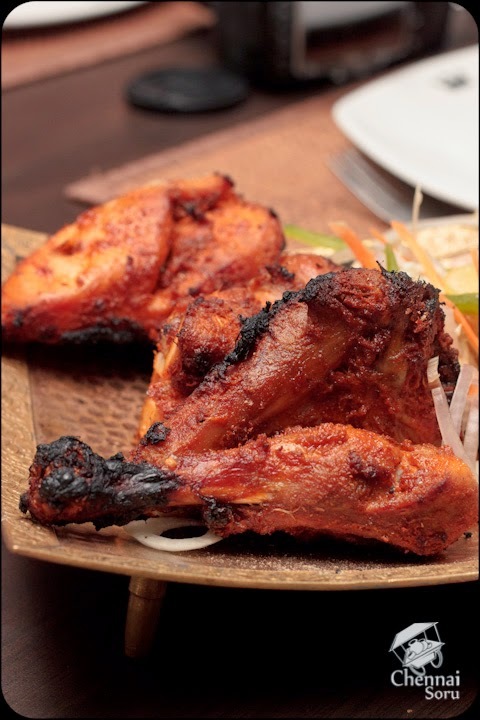 Tandoori Chicken, Murgh Banno Kebab, Kalmi Kebab and finally Punjab da kebab. Each very different in flavours. This gives you an idea of all the different spices and different methods of preparations that have gone in for these delicious dishes. Each juicy, succulent and fit for the royals. Moving to the main course we came to realise that the Tandoori Rotis are served free of cost. That's the first I have come across in Chennai. So people can just walk in and order their gravy items and have soft tandoori roti served at their table. Hats off for this decision. We were served with Butter Chicken Masala, Mutton Rogan Josh and Dal Makhani. To wipe them down, we were served with Naan Maharaja and the soft tandoori rotis. 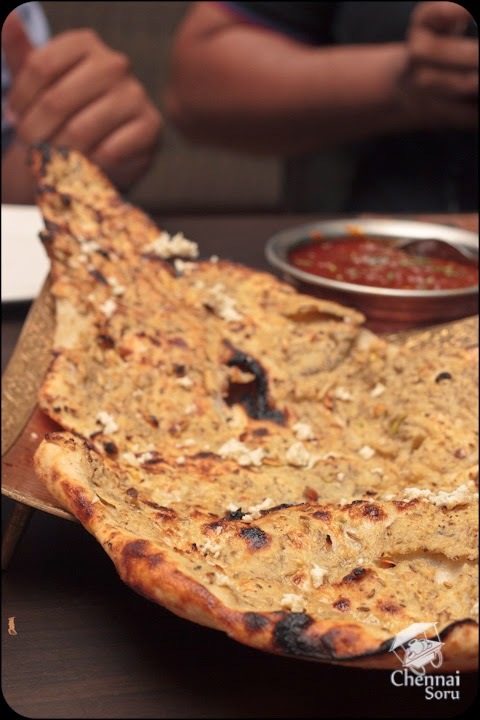 Naan Maharaja is a huge naan which is as large as your forearm, not a kids forearm but a full grown adult's. Packed with cashews, almonds and saunf with a double layered bread. 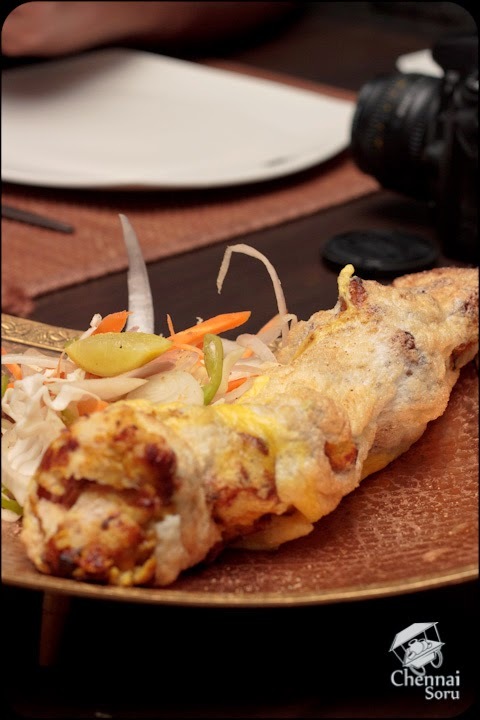 A true maharaja in its size, taste and texture. A piece of Maharaj and a little bit of butter chicken and I was instantly transported to Delhi. Flavours very very similar to what I have had at Delhi. Mutton Rogan Josh, though I have had many variations, this was the best - soft medium cooked mutton in a spicy gravy. 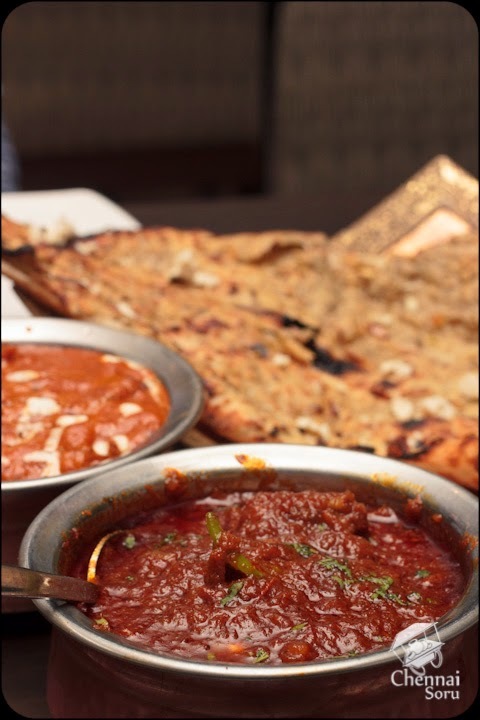 The combination of the sweet Naan and spicy gravy support each other to tingle your taste buds. Finally the Dal Makhani! It was just brilliant. You can slurp it alone, without any bread. 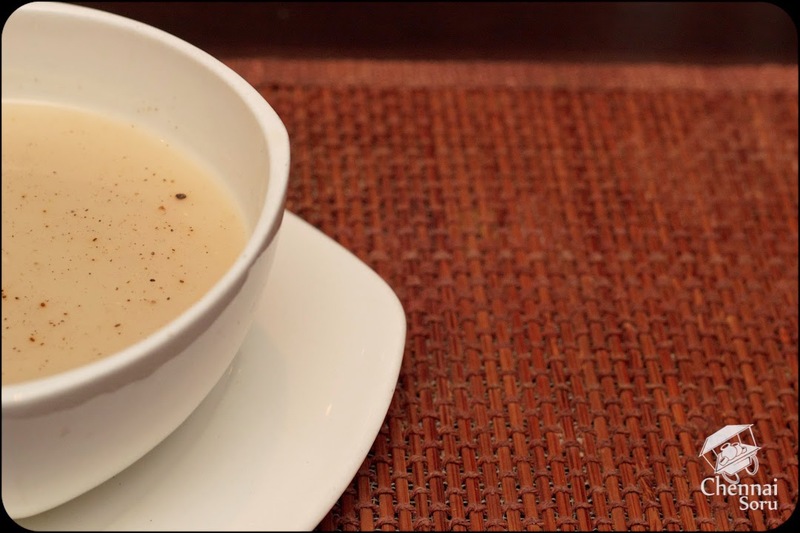 Just when we thought that we were stuffed, we were served with a Kashmiri Pulao. I don't think I have had a Kashmiri Pulao as rich as this, ever in my life. Usually it is rice with dry fruits. But here they have taken it to the next level. 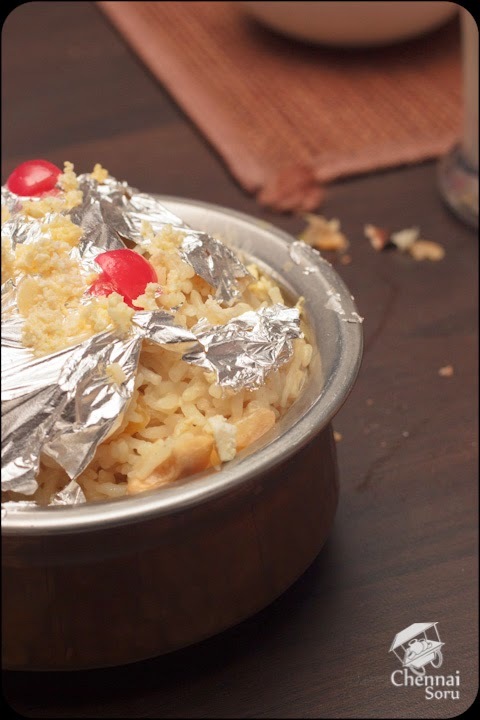 Cooking the rice with cream and dry fruits made it a bite of heaven. 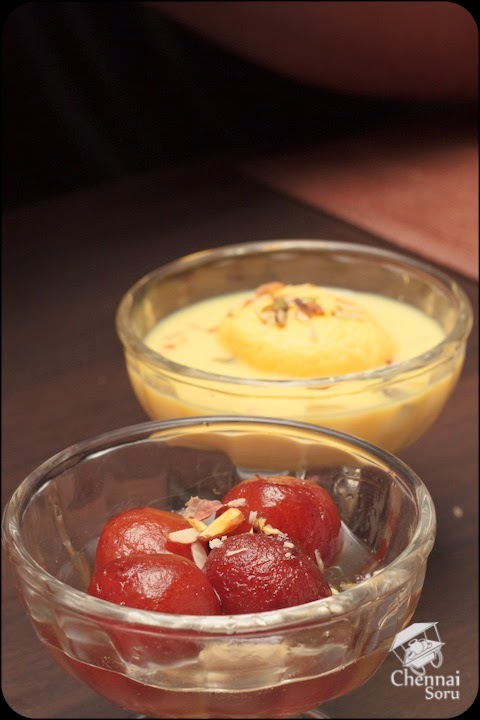 Finally after the delicious round of main course we decided to sample just the Gulab Jamun and the Rasa Malai. Rasa Malai was just brilliant, it was soft and sweet while the Gulab Jamun was good as well. On entering the restaurant one would notice extraordinarily large chairs at the entrance which welcomes you with comfort and grandeur. 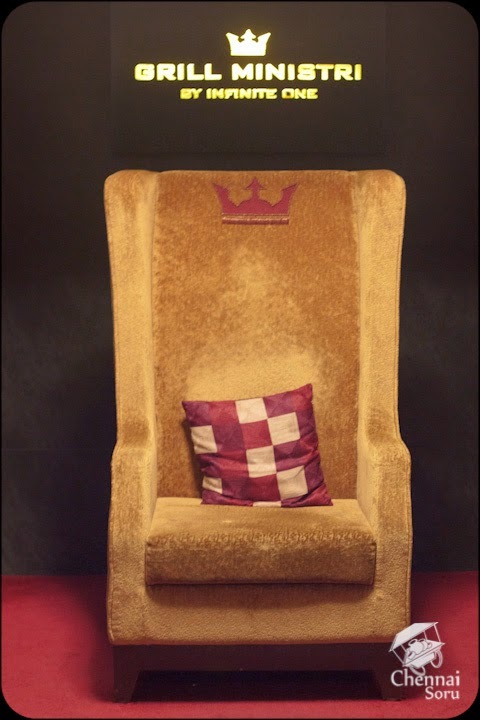 This definitely sets the tone and you do feel like you were dining at a royal court. 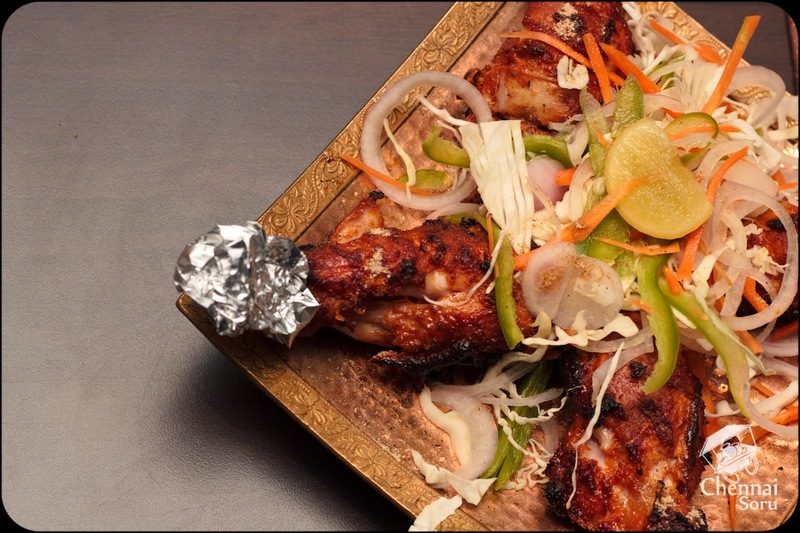 With Tandoori Rotis being served as free, Ordering just a starter, a side dish and a dessert would cost Rs 800 for two. This is the best value 3 course meal one could have. Grill Ministri is located in Mogappair West. If you do encounter a difficulty in locating it, search it on Google Maps.